Ted Cruz, "amnesty" accusations: Rubio, Bush, Walker illegal immigration positions would reward Democratic plot, he says. 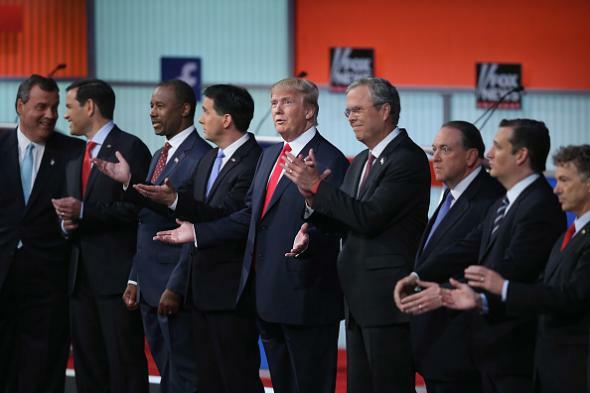 A flock of Republicans onstage at last Thursday’s Fox News debate in Cleveland. Cruz … attacked Jeb Bush, Scott Walker, and Marco Rubio as “vocal, aggressive, repeated proponents of amnesty,” who, if they receive the GOP presidential nomination, won’t be able to stop Hillary Clinton from pursuing President Obama’s “objective” of fundamentally transforming America. If you listen to the clip, what Cruz is saying does actually make some sense. Bush and Rubio, while they would personally not call it “amnesty,” both currently support immigration reforms that would allow some undocumented immigrants to secure legal status (though not necessarily citizenship). Walker has supported such measures in the past. And Cruz is suggesting that such candidates would have trouble drawing a distinction between their positions and Clinton’s in a general election in the same way that Mitt Romney had trouble attacking Obamacare because he’d pushed through a very similar program in Massachusetts. The big difference here? While Obamacare remains a divisive issue to voters, there is very broad public support for letting undocumented immigrants stay in the country if they meet certain requirements. Trying to deport all 11 million undocumented immigrants who are thought to be in the country would be neither practical nor popular, and the GOP is not likely to make much hay in the general election by nominating an anti-amnesty candidate. Which is probably why Bush, Rubio, and Walker are trying to wishy-wash their way to empathetic-sounding moderate positions right now—without alienating primary voters by using the word “amnesty”—in the first place.